The engine speed at which maximum advance is reached is dictated by the weight of the conterweights and the stiffness of the small retaining springs. Being a 1981 model, my bike was fitted with the earliest of hall effect beancans. These seem to have heavier counterweights. As a consquence, the springs are slightly stiffer than the later versions. I began by attempting to lighten the old weights by drilling them. This was disastrous! The older weights are case-hardened and nigh on impossible to scratch, let alone drill (even with tungsten carbide bits). So, if you have one of these older beancans, don’t attempt to drill them lest you destroy the weights and lots of good tooling (note cracks in the image above – and that was the good one!). Instead, grind in the safe area indicated. As I didn’t go with this method, it is unclear how far up the rev range the point of maximum advance will be pushed if the indicated area is removed. However, it would be fairly safe to say that removing indicated area would push max advance up ‘a few hundred RPM’. You would have to make your own measurements to confirm. When removing material from counterweights, both older and newer, make sure this is done as a pair with both weights securely clamped together in perfect register. This ensures that the same amount of material is removed from the same area of each counterweight. After demolishing the counterweights of my ‘older’ beancan, it was off to the wreckers where I found a damaged can that cantained a pair of newer (undamaged) counterweights as pictured above. These weights are lighter than the older ones so it followed that using them with the stiffer springs of the older can should push proceedings up the rev range by an amount. 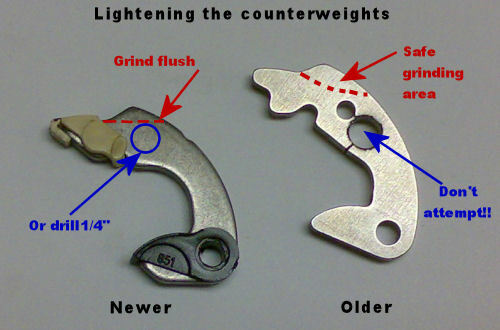 In addition to this, on an intuitive whim, I ground the little knob off the top of each weight as shown above. 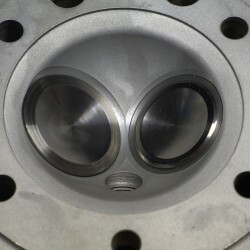 The measured result of these mods were to push the point of maximum advance up to around 3750 RPM. If you don’t have the stiffer springs of the older can to use with newer weights then you are limited to the removal of material from the weights. The good news is that the newer weights are not case hardened and can be drilled which is what many folk have indeed done. So the common trick of drilling a 1/4″ is OK in this case. Remembering that with the second camp as described here, the timing at idle is set close to stock – maybe 1-2 degrees further retarded. Therefore, in order that maximum advance is retarded by 4-6 degrees to around 28 degrees, the range of the beancan needs to be restricted. The first method I used was to place a couple layers of shrink tube over the tabs – this didn’t work very well as the tube slipped off after a while. The other well known method is to bend each tab inwards by about 2mm. Use a vernier to make sure that you bend both the same amount. Then put everything together in the bike, set idle timing to 4-5 degrees and use a strobe to check that the maximum timing is 28 degrees as you rev up the engine. 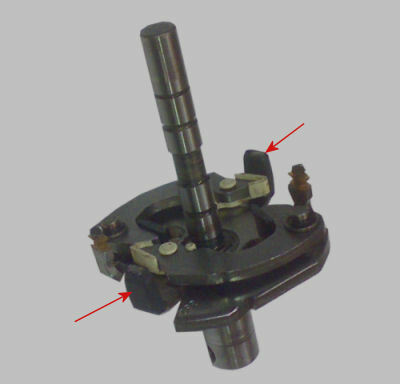 Remember that 1 degree of crank angle shows up as about 2mm along the flywheel so at 28 degrees, the Z mark should be hovering around the bottom of the viewing port.